Thomas FOLLAND (1600 – 1686) was Alex’s 10th Great Grandfather; one of 2,048 in this generation of the Shaw line. Thomas Folland was born between 1600 and 1611, some say even 1620 in England. His parents were Samuel FOLLAND and Emma [__?__]. He married Elizabeth [__?__] Thomas’ will is dated 1 Oct 1686 in Yarmouth, Barnstable, Mass and was proved 31 May 1687. Elizabeth [__?__] was born about 1611 in England. Mary’s name is often written Folland, but contemporary Yarmouth records consistently spell her father’s name Falland. Thomas was permitted to dwell at Yarmouth before June 1641. 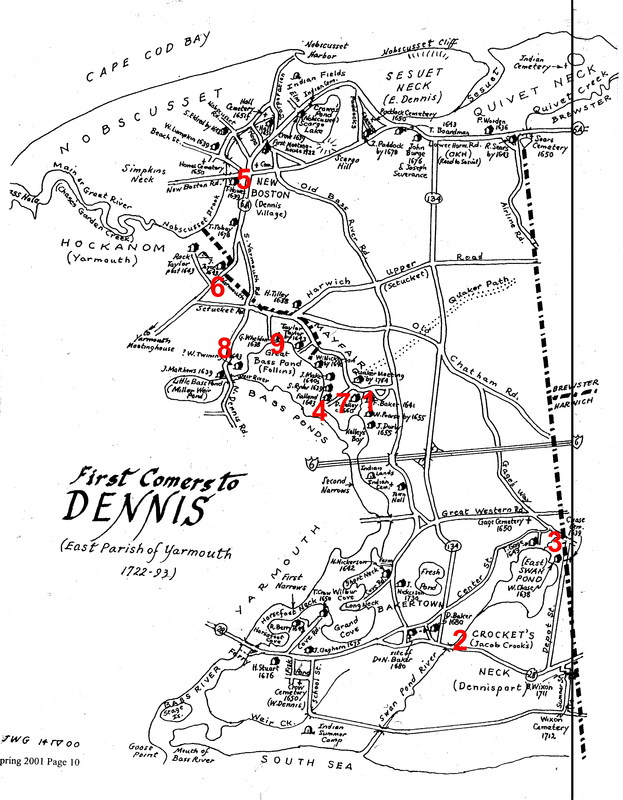 He lived at what became the Mayfair area in Dennis, at the head of Kelley’s Bay on Bass River and near Follins Pond. His original neighbors were Francis BAKER, Gabriel WHELDON and William TWINING. The neighborhood is sometimes called “The Head of the Point”. Mr. John Miller, Joseph Howes. 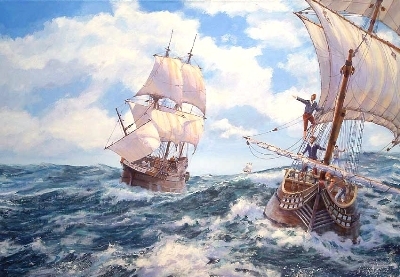 In 1665, to settle the difficulty at Monomoy, now Chatham between William Nickerson and the Colonial government respecting the illegal purchase of land of the Indian sachem there, Nickerson was allowed one hundred acres of the purchased land, and Major John FREEMAN, with Thomas Hinckley, William Sargeant, Anthony Thacher, Nathaniel Bacon, Edmund HAWES, Thomas HOWES, Sr, Thomas FOLLAND, Sr and Lt. Joseph Rogers was allowed a grantee of the remaining portion with the privilege with the above named to purchase adjacent land. In 1672, Major Freeman disposed of his right to William Nickerson; and in 1674 Major Freeman and Capt. Jonathan SPARROW were appointed to lay out Nickerson’s land with instructions, but for some cause the work was not accomplished by the committee until 1692. 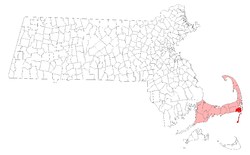 Native American tribes who lived in the Chatham before European colonization include the Nauset, specifically the Manomoy or Monomoy people. “Manamoyik” was a Nauset village located near present-day Chatham. Explorer Samuel de Champlain landed here in 1606, contacting (and skirmishing with) the Nauset. English settlers first settled in Chatham in 1665, and the town was incorporated in 1712, naming it after Chatham, Kent, England. Located at the “elbow” of Cape Cod, the community became a shipping, fishing, and whaling center. Chatham’s early prosperity would leave it with a considerable number of 18th century buildings, whose charm helped it develop into a popular summer resort. Follins Pond is named for Thomas Folland. 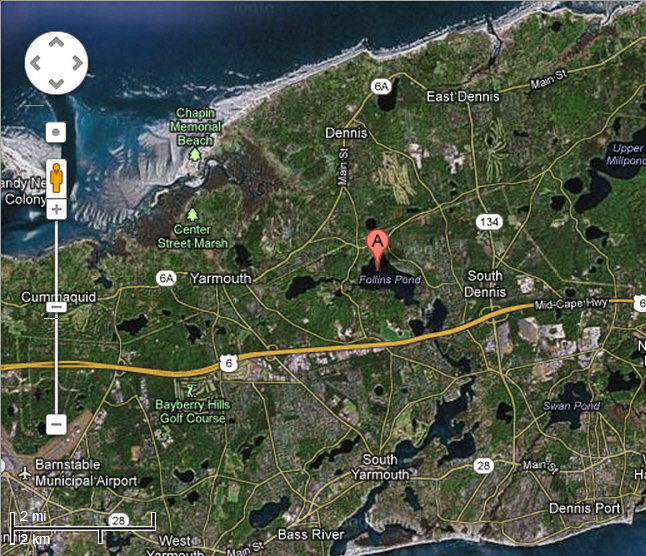 It is a brackish lake on Cape Cod, separating the towns of Dennis and Yarmouth, Massachusetts. The lake is connected to Nantucket Sound via the Bass River. Follins Pond is noteworthy primarily because there has been an attempt to connect it to the semi-legendary lost Norse colony of Vinland. In the 1950s, Frederick J. Pohl investigated Follins Pond and claimed that he had located shore rocks along the pond into which were drilled holes that strongly resembled Norse mooring stones (the Norse were known to drill holes into which iron pins were inserted for the purpose of mooring their knarrer). Additionally, Pohl claimed that he had uncovered the tops of posts about a foot underground, arranged in a pattern that might have been that of either a Norse shipyard or drydock. Further, at about the same time a claimed “Viking horse bone” may have been unearthed at Follins Pond. Pohl was of the opinion that at least a few horses were brought from Greenland by the Norse on their further voyages of exploration. Pohl published a book in 1952 entitled The lost discovery: Uncovering the track of the Vikings in America which detailed this claim. It is not taken seriously by professional historians, as the evidence presented is rather scant and no archaeological finds of any significance have been made in the area since. Some of the road names around Follins Pond seem to reflect this theory. A Norsemans Beach Road can be found on the eastern shore of the lake, a Norse Road on the north shore of the lake, and a Valhalla Drive and Erik’s Path close to the south shore. Additionally, along the shore of a smaller body of water known as Kelleys Bay joined to Follins Pond by the Bass River can be found Vinland Drive, Skerry Road, Saga Road, Fiord Drive, Freydis Drive, and Lief Ericson Drive (sic). Further south, along the shores of the Bass River, can be found Lief’s Lane, Legend Drive, Old Saga Drive, Rune Stone Road, Viking Rock Road, Keel Cape Drive, Erickson Way, and Mooring Lane. Elizabeth’s husband Samuel Hall was born about 1636 (called eldest son in father’s will) in Charlestown, Middlesex, Mass. His parents were John Hall (1611 – 1696) and Bethia Farmer (1611 – 1683). Alternatively, his mother was Elizabeth Winnif (1613 – 1683) Samuel died 20 Jan 1694, probably in Yarmouth, Barnstable, Mass. Samuel died without surviving issue and in his will of 7 Oct 1693 he made bequests to “wife Elizabeth,” to “my eldest brother John Hall,” to “my second brother Joseph Hall,” to “my third brother Nathaniel Hall,” to “my fourth brother Gershom Hall,” to “my fifth brother William Hall,” to “my sixth brother Benjamin Hall,” to “my seventh brother Elisha Hall,” and made “my brother-in-law Thomas Follin” one of his overseers [MD 22:185-86, citing BarnPR 1:91]. The gap of six years between the first record of Bethia as wife of John Hall (2 November 1632) and the first record of a baptism for a child (13 May 1638) is puzzling. The eldest son, Samuel, was very likely born during this period, say in 1636, but this still leaves a sizable gap; and if John and Bethia Hall were residing in Charlestown throughout this period, why wasn’t a baptism for Samuel recorded? One possible solution derives from the problematic nature of the early Charlestown church records, which were recopied some years after the date of the events recorded. Savage demonstrated that the Charlestown church records have Richard Kettle married to his wife Esther Ward some time before the marriage actually took place. The same may have happened with John and Bethia. If that is true John and Bethia may not have married until about 1636, and if she were from some place other than Charlestown, perhaps Samuel was baptized there, in a church whose records no longer exist. This proposed solution may also explain the gap of four years between John Hall’s admission to Boston church and his admission as a freeman, for he may not yet have been twenty-one in 1630. The controversy was ended when on 7 August 1655 the court ordered John Hall to pay Francis Baker £8 for the remainder of Samuel Hall’s time [PCR 3:88]. “I the Sd David Okillia Senr” signed the will 10 February, 1696/7. The witnesses were Thomas Folland, William Baker, Sr. (by mark), and Isaac Perse, by a mark. On 19 July, 1697 the three witnesses made oath to the will, “the two former according to the coustom and the latter William Baker as he was in the presence of God”, and the will was probated, and administration granted to Jane Okillia, the widow, on 28 July, 1697. On 16 July, 1697, the inventory was taken by Thomas Folland and Benjamin Mathews. This entry was posted in 12th Generation, Immigrant - England, Line - Shaw, Pioneer, Place Names and tagged Chatham Pioneer, Follins Pond, Yarmouth Pioneer. Bookmark the permalink.